The women’s basketball team (16-12, 6-10) ended a five-game losing streak Feb. 17 with a 70-54 victory over Mount Vernon Nazarene University (10-18, 4-12). The win came with only two regular season games left for the Foresters. Sophomore guard Hailey Krewald attributed the victory to the positive attitudes of the team. The team participated in its eighth annual Pink Out during their Saturday game, supporting and raising money for breast cancer awareness. Assistant coach Joanne Green said the energy stemming from the event fueled their victory. The Foresters did just that. “We made several adjustments defensively, and that definitely was the key to turning things around on Saturday,” said Green. The team kept the ball rolling with a vengeful win Feb. 17 against Spring Arbor. 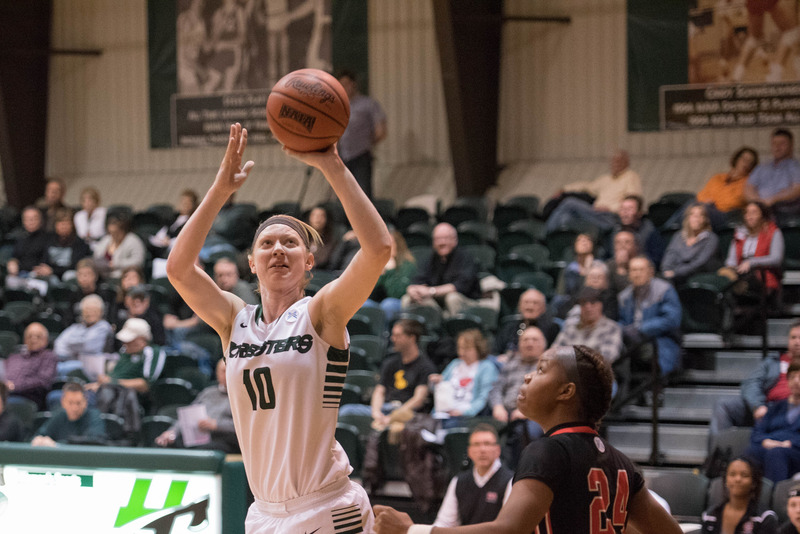 The Foresters dropped a road loss to the Cougars earlier in the season – a defeat that began a 1-6 seven-game stretch. Three Foresters guided a well-balanced offensive attack. Miranda Palmer led the pack with 20 points. Kelsey Hubble and Amelia Recker chipped in 18 and 16, respectively. Recker also had 11 rebounds, while Jaclene Bonnema collected 10. The win against Spring Arbor was extra special for three players – seniors Recker, Hubble and Bonnema. “It felt great to be able to get the win on our last night playing on our home court,” Bonnema said. The girls were recognized for their contributions to the program before tip-off, and each boasts notable statistics. Recker is nearing third place in the program’s all-time lead scoring list. Hubble, who scored her 1,000th career point Feb. 13, was presented with a basketball, commemorating the accomplishment. Bonnema holds both the career and season records for total blocks. The Foresters traveled to Goshen to take on the Maple Leafs on Feb. 23 in the first round of the conferenece tournament. They were a seventh seed in a pool of eight teams.